Spring is finally here and with it come the beautiful blooming flowers. 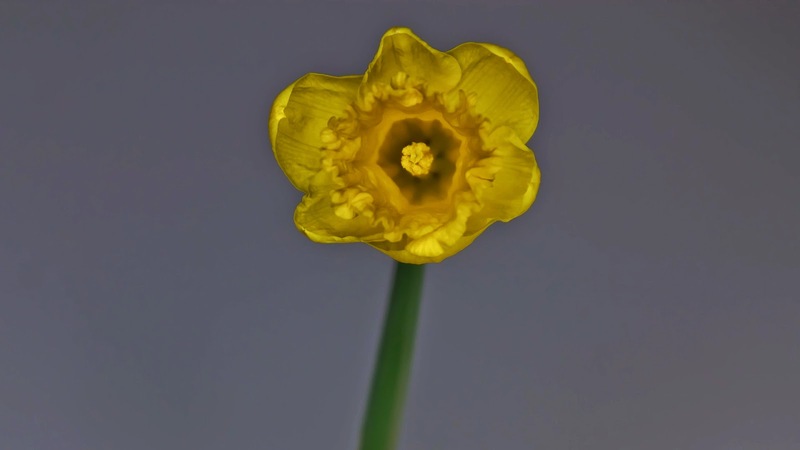 I have a wealth of these daffodils (narcissus) in my backyard and have always wanted to try capturing this bulb blooming through a time lapse. 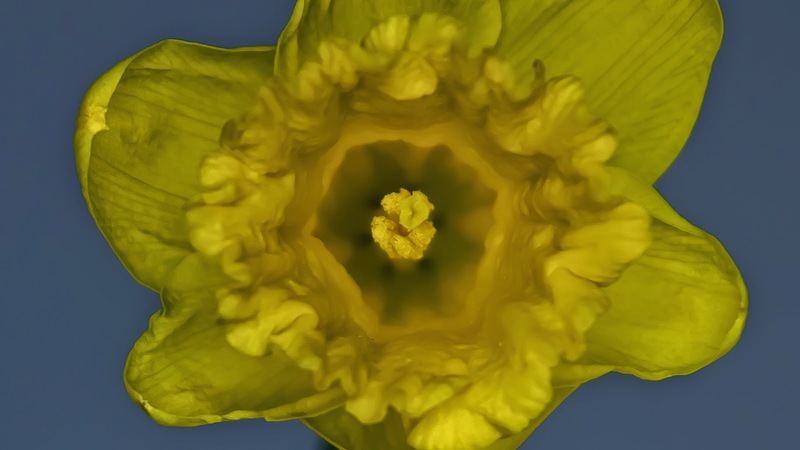 I initially set up my camera outside at a group of daffodils that looked ready to open. The intervalometer on my T2i took pictures every 25 seconds for 6 hours without the petals opening at all. With no more sunlight, I packed up and waited until the next day. I did take the image files and compile a short preview and what I saw was the flowers moving around so much due to outside wind that I knew I wasn't going to get a descent looking image if they were to bloom, so the next morning I took out a pot and some potting soil and moved one of bulbs inside. I set up a makeshift studio on my tool bench with a white foam core background. I set the camera to take a picture every 25 seconds again and left it to work. Coming back I had noticed that the stem had slowly moved the flower closer to my light source and slightly out of frame. The flower did not open yet, so I braced the stem just out of frame with a thick copper wire and then set the intervalometer to take a picture once every minute (hey, if it is going to take a while, might as well take a while). A let the camera go for a day and a half and came back to a full SD card and a fully bloomed flower. I had my fingers crossed when previewing the images and luckily it bloomed before I ran out of space. YAY! Since the original RAW image is quite large, I was able to create two video files for you. The close up is an real size 1:1 crop of the larger image and the wide is a scaled (resized) image to fit into the HD frame. What is nice is these files should be timed in sync so when you lay them together on a timeline you could seamlessly cut between the two. So not bad for my first experience with capturing growing plants. I'll eventually like to get some grass and vegetables, but as for now, this is pretty nice. Hope they help and hope you can use them! Your clips are absolutely to die for. We recently used a lot of them to make up the bulk of a promo video for an event we're having. Thank you so much for your work - because of your high quality footage, we're able to give ourselves a look of big budget professionalism.